The 2012 season was the first year A Valley and Beyond covered the Steelhawks. I live in North Carolina for over 8 years and Indoor Football is big there. 2015, the Steelhawks started in their new home, the PPL Center in Allentown, PA. At 2 events in the winter, the organization promised a lot of surprises this year. Knowing how they operate, I was expecting anything and everything. The game started at 4 with doors opening at 3. There was supposed to be a pregame and tailgate party. I was seriously curious about this considering one main factor: the arena is in center city Allentown! You know: parking garage (good luck on the grill) / streets / tight parking / etc. The restaurants and 7 / 11 provided everything you need to be outdoors and have a tailgate party, pre-made even!!!! 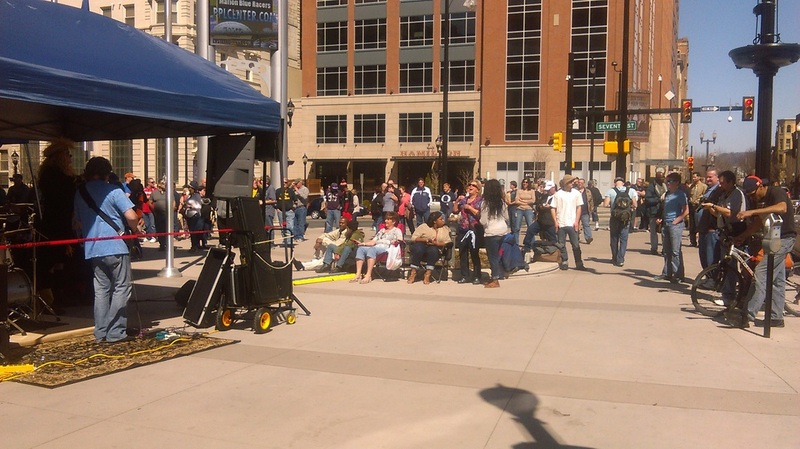 As you can tell, using common sense, the combination of live music and a crowd drew attention from people walking by. Great marketing tactic by the Steelhawks. Even if some of these people did not attend the game, they still found out about the Steelhawks, especially with Jimmy running around with the flag. Great job announcing the new home and 2015 home season!